Through all the decorations, partying, and celebrating that happens during a wedding, one of the most memorable moments for the bride and groom are the vows. Personalized promises and appreciation expressed to one another, the vows are a very important part of a wedding. 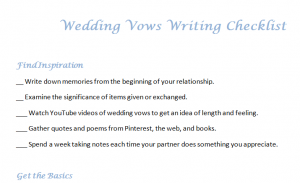 The Wedding Vows Writing Checklist will guide you step-by-step in writing your vows. It’s best to begin the process of vow creation at least 6 months before the wedding. For some, the vow creation will come easily and quickly – for others, it can be a tasking process. The best place to start is not quite from scratch, but from inspiration instead. Collecting quotes and reading other’s vows will set the layout for your own vows. You’ll get ideas for what you want your own vows to be like. Put together a file of quotes, memories, and expressions you feel fit your relationship. It’s also important to establish boundaries with your partner. You or they may want to keep some information private, or keep the vows light. It would be embarrassing for one partner to have a short, light-hearted speech and the other a long, heart-felt vow. Finally, get to writing! Just jot down bullet points, random sentences, even words. Eventually you’ll connect all that you love together, and your vows will flow. It’s not a research paper or an essay – just write how you think. Some people prefer to read their vows from a card on the day of their wedding, while others memorize them beforehand. Pick whatever is most comfortable for you. If you are going on memory alone, have your bridal party ready with the note just in case.